Yeah, that picture pretty much sums up the agenda of this week. 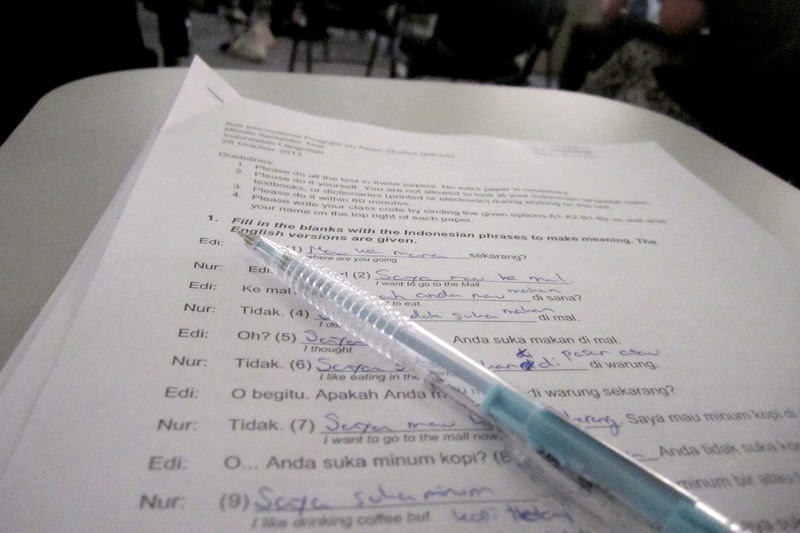 It's a picture of my Indonesian test that I took basically just to check if I have learned anything about Indonesian during last two months. As I've already mentioned many times, I don't study in Udayana University (I'm just hanging there to observe the everyday student life and of course try to help the students) so it's no use for me to do the actual test because I'm not going to get any credits from the courses. The situation is of course completely different for our exchange students who had in overell six exams during Monday, Tuesday and Wednesday. They really had to try their best during the exams because the results of mid term tests are a big part of the grade that they're getting from their courses. Of course the other big part are the final tests that take place in the end of the semester in December. So yeah, studying in Bali isn't just partying and surfing: students have to show that they've also learned something. There were two exams in Indonesian language and one in other courses (literature, tourism, Indonesian history, business law and economy). I heard that especially business law and economy were quite though but many students seemed to be quite satisfied with their answers. Anyway, there were a lot of happy faces around campus area on Wednesday afternoon when the mid term test week was over - especially because there was no excursion or workshop on Thursday so the students had an exceptionally long weekend ahead :) On top of that there was also some pretty nice Halloween pool parties on Thursday (even though Balinese people dont celebrate Halloween, the culture has arrived here because of the Western tourists). There's even more pool parties coming up during the weekend so yeah, I have to say: studying in Bali can be pretty fun even though sometimes you have to put some effort on your studies.